Oswalt Restaurant Supply is a top restaurant supply founded in the heartland of Oklahoma. We provide the best product and best service to the most important person, you, our customer. 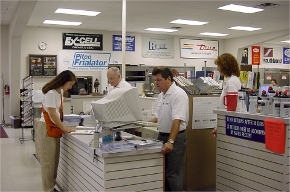 We offer competitive pricing on a large selection of products and our professional service is unmatched in the business. Whether you’re visiting our website, walking in the front door of our showroom, or calling us for a quote, our team is working hard to provide you with the best experience possible! Our team has grown to a composite of professionals specializing in the distribution of foodservice supplies as well as the planning and installation of equipment packages for foodservice establishments. By utilizing the latest technology our sales staff is able to focus your needs while making sure that you receive the best possible care. Whether through our online support, delivery on our own trucks, or equipment installation with our own people, your needs will have the personal attention of the Oswalt staff! To be the business in the foodservice equipment & supply industry with the highest ethical standards while delivering exceptional value to our customers, our employees, our vendors, and the communities we are associated with. The Oswalt Restaurant Supply contract division is a team of professionals specializing in furnishing foodservice equipment to the construction industry. Our focus on the construction industry and employee retention has allowed our people to forge relationships with your people making our team unbeatable! With over 20 years as a kitchen equipment contractor Oswalt has continually refined our processes, trained our team, and used the best technology available to make your project a success!